Calling Poets, Writers, Scientists, Academics! Bimblebox 153 Birds is calling for writers to contribute to this art project which describes the bird species that have been officially recorded at the Bimblebox Nature Refuge. We need a myriad of voices to tell us something about the following bird species that are currently wild and free avian residents or seasonal visitors to the Bimblebox Nature Refuge. WHY? Because the Bimblebox Nature Refuge is under threat from massive coal mining projects both directly over and under the refuge plus all around it, throughout the Galilee Basin. This means that the myriad life that thrives on Bimblebox is under threat, including the birds. nominate the birds you are interesting in from the list below (list two or more in order of preference in case your first is already taken. One bird will be allocated to you). Now Claimed…Brown Quail, Coturnix ypsilophora. Call: Double noted, ascending whistle: ‘pi-pieer’ or ‘tu-wieep’. Sharp chirp in alarm. Now Claimed…Grey Teal, Anas gracilis. Call: Male gives a sharp whistle with soft, low grunt and loud whistled ‘gedg-ee-oo’. Female has a loud, chuckled, descending series of quacks; also a slow, harsh, drawn out ‘que-aark’. Now Claimed…Australasian Grebe, Tachybaptus novaehollandiae. Call: Rapid, sharp chittering; harsher versions in threat or agression. Now Claimed…Pied Cormorant, Phalacrocorax varius. Call: Usually silent, but various cacklings, loud ticking, deep gutteral grunting in breeding colonies. Now Claimed…Little Black Cormorant, Phalacrocorax sulcirostris. Call: Usually silent but some ticking and croaking among birds in fishing flocks; gutteral croaks and tickings at nest. Now Claimed…White-necked (Pacific) Heron, Ardea pacifica. Call: A loud single or double croak in alarm or flight: ‘argh, aarrgh’. At nest a deep loud ‘oomph!’ a raucous cackle at changeover. Now Claimed…Glossy Ibis, Plegadis falcinellus. Call: Call in flight is an occasional deep grunted croak; if startled gives loud hoarse croaks. Now Claimed...Straw-necked Ibis, Treskiornis spinicollis. Call: Loud croaks when itending to fly or alarmed and repeatedly on take off. When joining flock anounces arival with rapid series of croaks. Now Claimed…Black-shouldered Kite, Elanus axillaris. Call: A short plaintive piping ‘siep’ repeated regularly at intervals of about 5 seconds; a drawn out wheezy, husky or scraping ‘scrair’ at intervals of 5-10 seconds. Also a ‘chek-chek-chek’ contact call and a sharp ‘kik-kik-kik distress call given agressively when defending the nest. Now Claimed…Brown Goshawk, Accipiter fasciatus. Call: Calls loudly in vicinity of nest, a high ‘keek-keek-keek’, rising in pitch. Also a rapid, excited, descending ‘kik-kik-ki-ki-kikik’, possibly in defence of nest site. At times uses a slow, drawn out ‘youwick, youwick’; female deeper than male. Now Claimed…Black-breasted Buzzard, Hamirostra melanosternon. Call: Usually silent but quite vocal near nest. On return to nest excited yelping, ‘kyik-kyik-kyik; as alarm high long ‘screee’. Also a variety of harsh scratchy grating sounds. Now Claimed…Yellow-tailed Black Cockatoo, Calyptorhynchus funereus. Call: Wailing kee-aaah; staccato growl. Simpson and Day. Now Claimed…Barn Owl, Tyto javanica. Call: Hoarse thin wavering reedy screech: ‘skee-air!’ Pizzey. Now Claimed…Sacred Kingfisher, Todiramphus sanctus. Call: Loud repeated ‘kek-kek-kek’. Rising ‘kee-kee-kee’ duets near nest. Simpson and Day. Now Claimed…Varigated Fairy-wren, Malurus lamberti. Call: High metalic, squeaky and rather clockwork or mechanical rattling trill at fairly uniform pitch. Morcombe and Stewart. Now Claimed…Weebill, Smicrornis brevirostris. Call: Wheet-will’; ‘whit-a-whit’. Lower ‘tizit’. Simpson and Day. Western Gerygone, Gerygone fusca. Call: Sweet, rising, falling, fading. Simpson and Day. Buff-rumped Thornbill, Acanthiza reguloides. Call: Tinkling reel. Simpson and Day. Now Claimed…Yellow-rumped Thornbill, Acanthiza chrysorrhoa. Call: Vivacious merry tinkling with cyclic pattern. Pizzey. 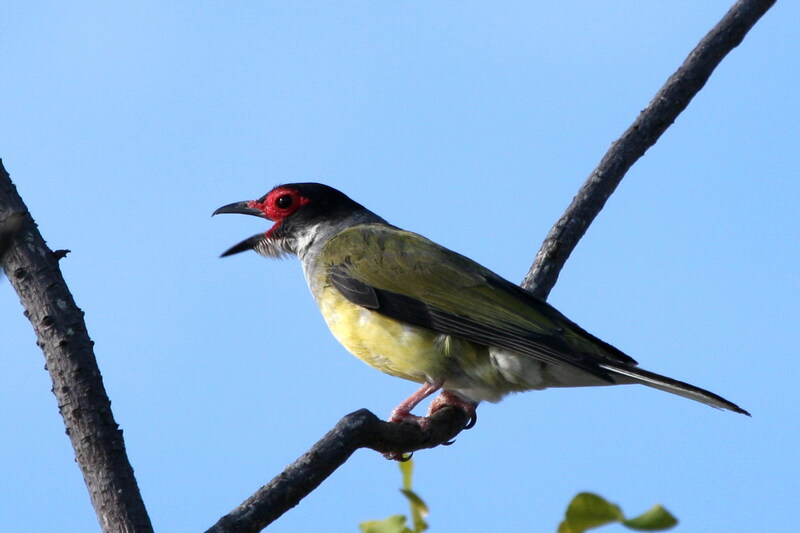 White-eared Honeyeater, Lichenostomus leucotis. Call: Jaring descending ‘chung-chung-chung’, mellow ‘beer-brick, beer-brick’. Pizzey. Grey-fronted Honeyeater, Lichenostomus plumulus. Call: ‘It-wirt, wirt, wirt, wirt’; single sharp note ‘boink’ Pizzey. Fuscous Honeyeater, Lichenostomus fuscus. Call: Arig-arig-a-taw-taw’; ‘guinea-a-week’; deep metalic rather twanging ‘clitchit-clee-you, clitchit-clee-you’ repeated. Pizzey. Black-chinned Honeyeater, Melithreptus gularis. Call: Curious high-pitched grating, croaking notes, developed into song. Pizzey. Now Claimed…Brown Honeyeater, Lichmera indistincta. Call: Song remarkably strong sweet and varied ‘sweet-sweet-quarty-quarty’.Pizzey. Now Claimed…Hooded Robin, Melanodryos cucullata. Call: YAP-yap-yap-yap-yap-yap’, yaps becoming shorter. Pizzey. Varied Sittella, Daphoenositta chryspotera. Call: Song described as ‘tzir, zit-zit, tzir-zit-zat-zit’ Pizzey. Now Claimed…Golden Whistler, Pachycephala pectoralis. Call: Rising ‘wheat-wheat-wheat-WHITTLE!’ a brisk ‘dee-dee-dee-ah-WHIT!’ Pizzey. Now Claimed…Restless Flycatcher, Myiagra inquieta. Call: A rasping ‘zhap-zhapzhapzhapzhap; a curious sustained grinding churring; a clear repeated whistle each phrase rising at the end like a man whistling a dog. Pizzey. Now Claimed…Torresian Crow, Corvus orru. Call: High pitched series of stacatto honkings, can finnish with one or more longer notes. Loud falsetto stutter. Simpson and Day. Now Claimed…Singing Bushlark (Horsfield’s), Mirafra javanica. Call: Sweet clear if spasmodic song; notes alternately shrill and trilling or rich and melodious. Pizzey. Now Claimed…Australasian (Richard’s) Pipit, Anthus novaeseelandiae. Call: Brisk splintered ‘pith’ or rasping drawn-out ‘zwee’. Pizzey. Now Claimed…Plum-headed Finch, Neochmia modesta. Call: Reported to be a single ‘tlip’ or ‘tleep’; at times drawn-out and high-pitched, scarcely audible. Pizzey. Tree Martin, Petrochelidon nigricans. Call: Dry little ‘drrrt drrrt’ and animated twittering song. Pizzey. Fairy Martin, Petrochelidon ariel. Call: Distinctive chirrup; also sweet twittering.Simpson and Day. Rufous Songlark, Cincloramphus mathewsi. Call: Song has a sweet, splintered, almost ventriloquial quality; often begins with a clear loud trill, then develops into full refrain, ‘a-witchy-weedle’, repeated. Pizzey. For Bimblebox 153 Birds the completed written piece would be less than 200 words and you would also be asked to submit an audio of you reading or reciting your piece. ← Bimblebox Artist Camp, 2014. How are you? Just to et you know i am still working on my print of the red backed fairy wren. Great to hear from everyone. I am currently in Miles helping with the demount of Bimblebox: art – science – nature which is off to Bunbury in Western Australia very soon! I will start responding to your emails as soon as I can, but it wont be today! Just wanted to say that if you are already on the project – I am actually looking for new writers to join. It has taken quite a while to build this project as there are such a large number of people invited to participate. 153 birds is one bird for one writer until I have all the birds represented by one writer each – this will give the project its many different voices. I ask you to initially pick more than one bird as often people will ask for the same one as you, so you may not get your first choice. Thank you everyone for your enthusiasm for the bimblebox birds! I have had some internet/email issues so if you have written to me and you haven’t had a reply, please write again!